Consider this. How well would your company perform if every person on your team was a clone of you? When you hire someone, do you go out looking for someone who has all the same skills as the people you already have on the team? If you answer honestly, you probably have to admit that without variety among your team members, you would lose a great deal of creativity, many fresh ideas, and the ability to see things from different perspectives. Why then would you run your company without seeking input from your team, as if your thoughts and ideas are enough? It seems ridiculous when you say it that way, but Forbes reported in October 2017 that fully 70 percent of workplace initiative falls short of the goal due to a lack of employee engagement. Listening to your team members is the key to effective operation and improved employee satisfaction. Managers who learn to listen see increased employee engagement, satisfaction, and productivity. With all those benefits, why is it still so hard to do? In 2016, a report by Deloitte found that one of the most difficult shifts for management to make is going from a once a year “conversation” with employees about their thoughts and opinions to an “always on” approach that listens constantly. The same study found that two-thirds of companies still only evaluate staff engagement once a year. Adding difficulty to the situation, only 22 percent of millennials surveyed felt that management would do something meaningful with their feedback. A lack of listening skills that reduces staff engagement has a significant impact on a company, right down to the bottom line. According to one study by Aon Hewitt, organizations where 70 percent of the workforce are engaged show higher rates of growth than those with lesser engagement. By contrast, the lower the rate of employee satisfaction, the more likely a company is to post a financial loss. Engaged employees are 87 percent less likely to leave the company. The United States Department of Labor estimates that the average company spends one-third of a new employee’s salary to replace the person who left. The Hay Group found that engaged workers are up to 43 percent more productive and make fewer mistakes than others. For most companies, listening to your employees has historically taken the form of annual satisfaction surveys, group meetings or conferences, and discussions with the Chief Executive Officer. However, in the new world of business, these expensive and time-consuming tasks are simply not enough. New ideas regarding employee engagement are emerging to make it easier to listen to your workplace team constantly. Social media: While most people think of social media as a way to communicate with the rest of the world, businesses can use the concept to keep up with team members’ ideas, questions, and suggestions for improvement. An internal Facebook page has worked well for Nokia, for example. The company also set up something called BlogHub where employees at any level of the company can post a thought or respond to someone else’s. You don’t have to create your tool though. Yammer and Groupe.io are two examples of inter-company communications instruments available on the market that can improve staff engagement. Chief Listening Officer: More and more large companies are coming to understand the value of having a Chief Listening Officer either on staff or contract. Study.com describes this position as someone who “specializes in monitoring both external and internal communications” about the organization. Companies that have chosen this route have realized improved employee morale, improved customer service, and higher staff retention rates. While not every company is large enough to sustain a full-time Chief Listening Officer, even a small company can build the measurement of employee satisfaction into the Human Resources or Public Relations Officer job description. Incorporating Listening Skills Into Management Training: Companies are taking note of the importance of listening to team members and incorporating that knowledge into manager training programs. In distributed environments where in-person training is impractical, virtual classrooms and interactive web-based teaching are utilized. Such staff engagement training focuses on the difference between hearing and listening, asking open-ended questions, and responding appropriately, among other topics. The concept of servant leadership as set forth by Robert Greenleaf in the 1970s involves leading a team or an organization by being a servant first. Listening is one of the most crucial skills needed to be a true servant leader, signaling that the leader genuinely cares what the team has to say. True listening allows the leader to gain a clear understanding of the team’s thoughts, ideas, and feelings. Once the leader has that understanding, he or she can take action that makes use of that information. Finally, genuine listening shows the team members that the leader can be trusted and respected, which goes a long way toward improved employee satisfaction. Annette Franz and John P. Rees of the Ritz Carlton Leadership Center point out the importance of setting aside time to listen if you are a true servant leader. 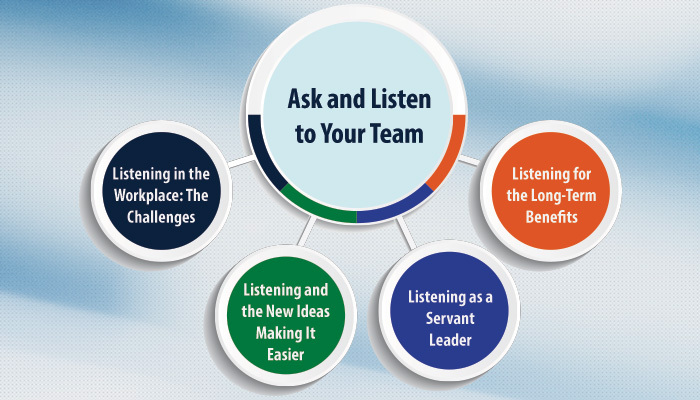 According to Franz, “If you’re too busy to listen, then you’re not a servant leader.” While some may see listening as an activity that takes away from more “productive” tasks, however, the teachings of servant leadership describe a process of giving and take that can lead to the identification of ways to increase productivity. For example, an open and honest discussion of processes may uncover areas of unnecessary redundancy. Reese advises managers to make a commitment of time to listening and stick to it, seeing it as important as anything else he or she can do to improve productivity and profitability. Since your team members know their jobs best, it’s very common for managers to learn ways to increase profitability from honest conversations with team members. Also, the link between reduced turnover and managers who listen well is clear in the research, as is the link between decreased turnover and increasing profits. While much as been made of the generational differences between baby boomers, gen Xers, and millennials, being heard by managers is important to all these workers. Keeping good employees in place means keeping them engaged in work they find meaningful and respecting their ownership in the processes. Listening honestly and earnestly is one of the easiest ways to show your team that you want to live out the principles of servant leadership. If you need help in implementing these strategies in your organization, contact Etech’s team of professionals today.